For Photographers , it may be interesting to take pictures in winter atmosphere , but he have to take some risks for this hard work. Those who practice the lookout when cold are particularly susceptible. For them and all those who must stay long in one place without moving it is recommended to create a space sheltered from the wind, whether in snow or other means must be high enough for the photographer is adequately protected and not suffer the cold sensation produced by the wind. Also the Photographer have to take care to his equipment , because condensations is the one which can cause the most damage to the material, it is formed due to a large temperature change. So it recommended to enclose the material in a plastic bag to prevent moisture from the weather. OK , but why we have to take this risk ? because the beauty of snow is not to miss , we have to choose the right subject of our photo and for me capturing an animal under snow is both beautiful and adorable. As we already know , photographing animal is so hard because you cannot prevent the movement , and the cold weather make this work more harder than before. 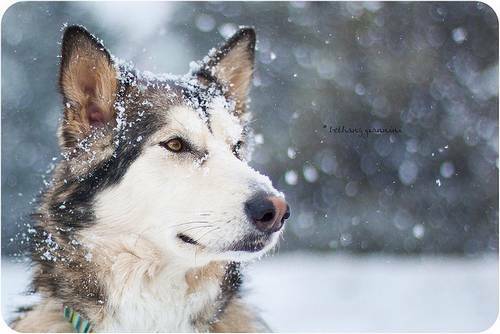 Without further a due, we share to you 35 beautiful Examples of Animals under snow photography taken by talented and patients photographers. All images are linked with their source , this will allow you to see a larger version and learn more about the photographers and buy the photo if you want. Otter playing in the snow.